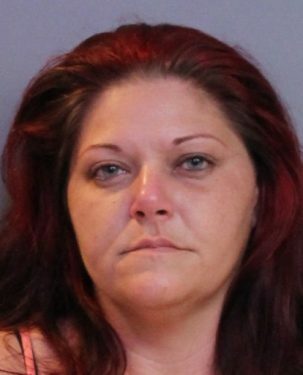 Thirty-three year-old Stephanie Stinson of Winter Haven missed her chance to be mother of the year after she took her 15 year-old daughter to purchase drugs and wound up leaving the scene of a crash with injuries. On 10-15-17 at approximately 1:37 a.m., officers were called to the scene of a hit and run traffic crash on 6th St. SW that injured 15 year-old Austin Lopez of Winter Haven. Stinson had told her 15 year-old daughter that she wanted to purchase some marijuana and asked her daughter to set up the transaction. The daughter contacted someone she knew who met them at a laundromat located at 834 6th St NW in Winter Haven. Stinson paid $20 for a bag of marijuana and expected change in return. When she didn’t get her change, Stinson attempted to block the vehicle from leaving. Lopez, who was getting inside of the vehicle on the passenger side, was struck when Stinson rammed her blue Dodge Avenger into the vehicle. The impact launched Lopez over the hood of the vehicle where he landed in the roadway. He suffered significant injuries including facial fractures and other broken bones. Lopez was air lifted to Arnold Palmer Hospital with serious, but non-life-threatening injuries. Stinson stopped briefly to pull off a piece of her vehicle that was dragging and both she and her daughter saw Lopez injured in the roadway. As they left, Stinson’s daughter called 9-1-1, but they did not stay at the scene. A piece of Stinson’s car was lodged in the silver Chevrolet she had struck and police were able to determine the ownership by the vin number marked on the vehicle part. Initially, police were unable to locate Stinson’s vehicle; however her estranged husband called police at 7:06 a.m. to report that he found his vehicle with damage and Stephanie had sent him text messages stating she had struck a vehicle and a person earlier. On 10-15-17 at 8:09 a.m. Stinson and her daughter reported to the Winter Haven Police Department to give statements to the incident. Stinson was taken into custody and charged with Leaving the Scene of a Crash Involving Injury (F.S.S. 316.027(2)(A) F3 and Contributing to the Delinquency of a Minor (F.S. 827.04(1) M1.